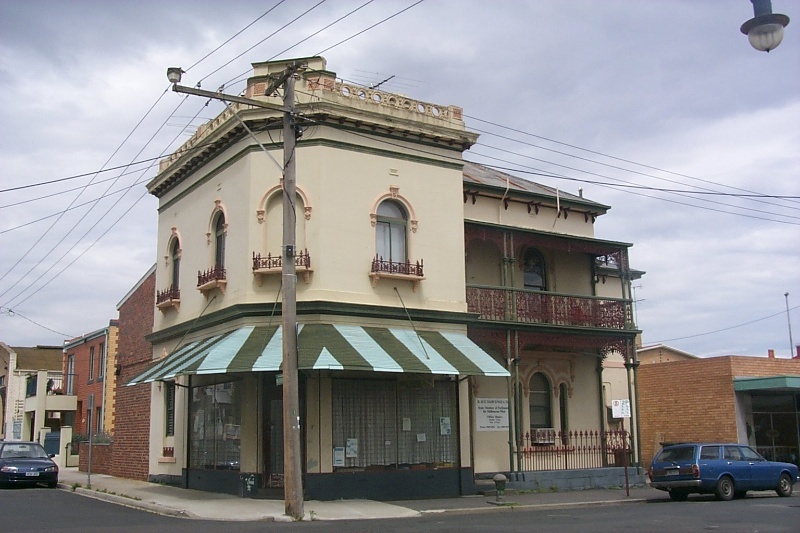 Architecturally, a typical shop and residence of the period but located in a valuable civic-commercial precinct. Historically, a focus of the early commercial development in Ballarat Street and linked with the renowned J.C. Schild and tenuously to the lesser known John Copplestone. A two-storey conservative Italian Renaissance adaptation, with stuccoed walls and two-level cast-iron veranda on the residential half of the premises. Other domestic traits are the exposed hip roofs, the Palladian fenestration with its cement architraves and bracketed pediments (lower windows) also the cast-iron balconettes on the upper level and iron palisade fence. The commercial end is parapeted (altered) with a guilloche pattern balustrade. The raised entablature has 'Established 1860' in bas-relief presumably indicating either the origin of Schild's or Copplestone's agency business in Melbourne (?). The shopfronts have been replaced around 1920. External Integrity: Shopfronts replaced, canopy added, corner window blocked (upper) and lower north (conunercia) section upper window joinery replaced with aluminium. The parapet detail has been altered and part of the iron balustrade is gone but a recent colour schemeis sympathetic to the original. A two-storey brick addition has been made to the north-east (?) comer. Streetscape: Good corner building, relating in period to the Murray Street former shop row and completing the block as a late Victorian match to the southern corner with Anderson Street.